Be "PMP® Exam Ready" at the end of the course! A guided self-study program, this seminar prepares candidates for the current version of the Project Management Institute's PMP® certification exam, an essential prerequisite for certification as a Project Management Professional. The classroom sessions familiarize the participants with the content and make-up of the exam, and with the level of competency needed to pass it. The seminar is offered both on a public subscription basis and as an in-house seminar for the employees of a single organization. The features and benefits of the seminar are described below. Please contact me if you would like more information. Delivered by an experienced practitioner, the seminar topics are presented in terms of the practical issues that arise in the management of real projects. The aim is to provide an understanding of good practice tools and techniques that will be of value to individual participants, their clients, and their employers. I recommend it to anyone wanting to become a project manager" and "very valuable in providing practical and useful knowledge I can take back to the workplace". More than ever, organizations are depending on project management practices to deliver new products and services, systems, and facilities. Many are realizing that successful projects - quality results, on time, and on budget - require a unique set of project management competencies. Typically the required knowledge is learned "on the job", and the costs of such "training" can be very high: poor products, missed deadlines, unhappy clients, stressed-out project teams! PMP® certification is a third party affirmation of a project manager's understanding of project management fundamentals. Many organizations now require the designation as a condition for serving as a project manager or for career advancement. Worldwide, there were 791,448 PMPs in July 2017. Over the previous year, the number of PMPs increased at an average rate of more than 4,700 per month. The certification preparation seminars complement in-house project management training and reinforce organizational initiatives to strengthen management capabilities. The training is applicable to any field of project endeavour. Since 1996, more than 1,500 practitioners from hundreds of organizations in Western Canada have participated in the PMP® Certification Preparation Seminar. The attendees practice in fields which include information systems, telecommunications, heavy construction, health care, research, marketing, and new product development. A large portion of the attendees have come from organizations that had enrolled staff members in previous sessions. The PMP® Certification Preparation Seminar features a highly successful method of instruction: a combination of lectures and sample examinations that help participants identify topics requiring reinforcement. For each lecture there is an advance reading assignment, and for some lectures there are homework assignments dealing with quantitative problems. Some of the problems and problem solutions can be downloaded from the Sample Problems page. Each of the subject-area lectures includes a trial of sample exam questions and a discussion of the rationale for the one correct choice. The mock examination at the end of the seminar is composed of sample questions not previously exposed to the participants. Again, there is a discussion of the rationale for the answer. Most important, the participants are able to assess their personal levels of preparedness by comparing their own scores to those of their classmates and to those of other classes - all anonymously reported of course. The scheduling of the lectures at intervals offers a major advantage over a concentrated, continuous course. It encourages the participants to organize their own study programs on a structured time table. It is designed to have the participants "exam-ready" by the end of the course. During the lectures or the on-line conferences, they can ask for clarification and explanation of study materials they have already examined. Through the sample exam questions they get immediate feedback on their levels of preparedness in each subject area. The course material is maintained up-to-date and is compliant with the current version of PMI®'s Guide to the Project Management Body of Knowledge, Sixth Edition, 2017. . The seminar provides 45 hours of classroom contact time. This is more than the minimum 35 hours of project management education required for PMP® certification. Major organizations have endorsed the training by enrolling additional members of their managerial staff in successive seminar presentations. Previous seminar groups have achieved a high pass rate on the internationally administered PMP® exam. The version of the PMP exam which will be administered in 2019 was released in the first quarter of 2018 to reflect the issuance of the PMBOK® Guide – Sixth Edition in September 2017. The updates reflected changes in lexicon and terminology introduced in the Sixth Edition. It is emphasised that the PMP exam is NOT a test of the PMBOK Guide ® . The guide is described as the "primary reference" for the exam. This means that the definitions and terminology used in the exam are consistent with the guide. The knowledge content of the exam, on the other hand, is based on the broad scope of project management experience and literature, and that is the basis for the Certification Preparation Seminar. The questions in the PMP exam are developed in accordance with the exam content outline, published by PMI, which reflects the broad knowledge base. The current content outline, issued in 2015, will remain the specification for exam questions in 2019. It has NOT been revised since 2015. The Project Management Professional (PMP)® credential examination was previously updated effective January 12, 2016, to reflect the revised exam content outline which was issued in June 2015. The modifications to the content when compared to the 2011 content outline were not major. As evidence that they did not represent more than a minor change to the exam content , PMI did not have a blackout period on the reporting of exam scores after January 12, 2016, as it had done in the past following the release of a new version of the exam. There was no blackout in 2018. The purpose of the blackout is to recalibrate the passing score following the introduction of new exam questions. This suggests that there was only a small number of new questions in 2016, and a minimal number of new questions in 2018, if any. Additions have been made to the course materials to incorporate the PMBOK updates. The data base of questions for the PMP exam periodically undergoes an update, either to reflect references to a new edition of the PMBOK Guide , or to reflect changes to the structure of the knowledge specification for the exam. While we have seen no substantial changes to the knowledge content of the exam following these updates, there apparently have been adjustments to the required passing score for the 2009 and 2011 versions, and then again for the 2015 version. For versions of the PMP exam prior to 2009, seminar alumni achieved a long term pass rate in excess of 80% on the first attempt. Following the 2009 update, this rate fell to about 70%. Following the 2011 update, it fell further to about 50%, as PMI once more re-calibrated the passing score, and it appeared to remain at about that level following the 2013 update. Since the 2015 update, the overall pass rate is again in the range of 70% and higher. This is college level training. Participants should be familiar with work breakdown structures, critical path scheduling, estimating and budgeting, quality control, and contract administration; as well as basic managerial accounting and economics, motivation theories, and fundamental statistics. Self study materials will be suggested in the seminar for participants who want to refresh their knowledge or who wish to acquire a basic understanding of any of these prerequisite topics. In addition to the seminar sessions, preparatory reading is suggested. Participants are encouraged to form study groups. Walter Wawruck, MBA, P.Eng. (Alberta), PMP®, is a consultant specializing in project management services. Since 1971, he has participated in the management of a wide variety of projects, ranging from computer systems development to Arctic pipelines, and has assisted clients in strengthening their organizational capabilities in project management through the adoption of best practices. 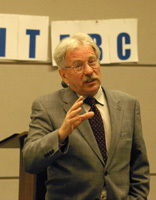 Walter Wawruck has provided training in project management since 1981, in Canada, the US, and South America. In addition to his public subscription seminars, he provides in-house seminars, workshops, and training services to individual clients. "An excellent course, by a very knowledgeable and personable presenter"
Go to the Qualifications page for more on Mr. Wawruck's education and experience. PMP® Certification requires that an individual meets eligibility requirements in the areas of education, experience, and knowledge. A candidate must have three years of project work experience with a Bachelor's degree, or five years of project work experience without a degree, and must then pass the examination. There is an additional requirement for project management education, in the form of 35 hours of classroom instruction, starting in 2002. Once certified, a PMP® must initiate a personal program of continuing professional development to maintain the designation. For more on this topic see the PMI Certification page. Introduced in 1983, PMI®'s professional certification program is designed to enhance professionalism in project management and to provide project managers with a structured approach to developing their personal careers and their professional capabilities in project management. A PMP® Certification application must be submitted directly to PMI® in order to write the exam. Candidates may also choose to first take the training , and to subsequently apply for certification and the exam. Applicants have the option of submitting a paper application for the exam. However, an on-line application is available and is recommended. Following the acceptance of an application for the PMP® exam, the candidate is given the option of writing a computer based exam or a paper based exam. The candidate is then asked asked for payment and is given instructions for booking an exam date and location. Once an application has been accepted, the candidate must write the exam within one year. No extension is allowed. The computer based exam is available in most U.S. and Canadian cities through Prometric (formerly Sylvan Technology), by appointment, after a candidate has received notification of eligibility from PMI®. Download a PDF version of the Certification Handbook for an explanation of the educational and experience prerequisites to certification. PMP® certification and exam fees, which are not included in the seminar fee, must be paid directly to PMI®. For PMI® members, the fee for the computer based exam is $405 US. Each classroom seminar consists of six, full-day sessions held at two and three week intervals. This format allows time to read from the resource materials in preparation for the lectures. Previous classroom seminar participants have found great value in meeting during evenings or noon hours between lectures, in volunteer led study groups, to review and discuss the topics covered. To assist exam candidates in preparing their certification applications to the Institute, an evening workshop will be held prior to the start of each classsroom seminar presentation. These workshops are open to all interested parties. The next classroom seminar presentations for Regina and Vancouver are planned for the January through March period in 2019. See the specific schedules below. Regina, Saskatchewan: Winter 2019 Seminar , six Fridays, two and three week intervals, January 4 to March 22, 2019. Evening workshop on preparing a certification application: January 3, 2019. The registration form is available for download now. Vancouver, British Columbia: Winter 2019 Seminar , six Saturdays, two week intervals, January 12 to March 30, 2019, Evening workshop on preparing a certification application: January 10, 2019. The registration form is available for download now. Morning coffee and muffins, lunch, and refreshments are provided as part of the classroom seminar. The fee for the examination must be paid directly to the Institute, and is not included in the seminar fee. Established in 1969, the Project Management Institute has responded to society's growing need for skilled project managers. A not for profit society, the Institute is democratically governed by its membership made up of individual practitioners. Established to advance the state of project management professionalism in the world, PMI® has more than 486,000 members in 286 chapters, including 18 in Canada, as of July, 2017. Visit the PMI® website. The Regina based South Saskatchewan Chapter of PMI® pursues an active program of knowledge building, networking among practitioners, and professional development in the local community. It currently has over 660 members, roughly 80% of whom hold the PMP designation. Throughout all but the summer months, the Chapter holds regular meetings featuring talks on current management issues, practices, and projects. In November of each year, the Chapter sponsors a Professional Devlopment Conference. The Chapter is committed to providing additional professional development opportunities for PMP®s in the form of service to the profession and continuing education. Visit the Chapter website. Phone (604) 879-8752 · · · · Or E-mail me now! This page was last updated on September 8, 2018.